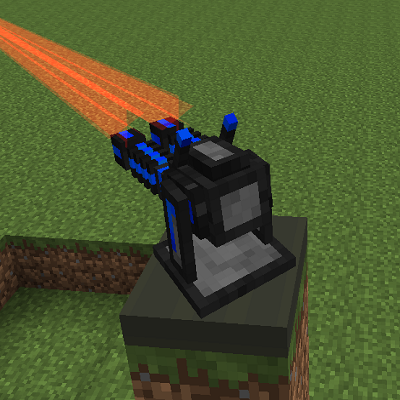 This mod adds 5 basic sentry guns from the original ICBM 1.6.4 mod. These sentry guns are built on the Armory Mod allowing compatible functionality with other sentries and full customization of content. This includes usage of the global access system in Voltz Engine and the entity target selection system in Armory. Why not add the sentry guns to ICBM-Classic? The main reason is to open up this mod to as many people as possible. Having it in a PvP driven mod like ICBM closes the door to many modpacks and groups. The secondary reason is new version requires Armory mod to function. Thus making it part of ICBM-Classic would require another dependency. As to why the change to use Armory for sentries? This was done in order to improve the handling of the sentries. With the Armory mod, sentries can be created using JSON data instead of code. This allows easy development and customization over the content. In addition, to providing a solid foundation for shared functionality on all sentries mods. Is the AA sentry capable of shooting down ICBM-Classic missiles? I have tested them numerous times, and they fire at mobs, animals, etc. However, even when set to fire at entry.type.missile and entry.type.rocket, nothing happens at all. They do not move or fire. I was just wondering if the mod hasn't been updated yet, or it has and I'm doing it wrong. Great sentries anyway! I need to get around to adding an interface to ICBM-Classic. That is likely why its not being targeted. my most favorite sentries, ever! Audio? have yet to re-add it from the old version. will these eventually be released for 1.10? The mod actually has no 1.7.10 code so it only needs the Armory Mod and Voltz Engine updated to 1.10 to function. Those mods should be updated to the latest over the next few months. We are almost finished with the 1.8 update for Voltz Engine and should be to 1.9 by the middle of next month.